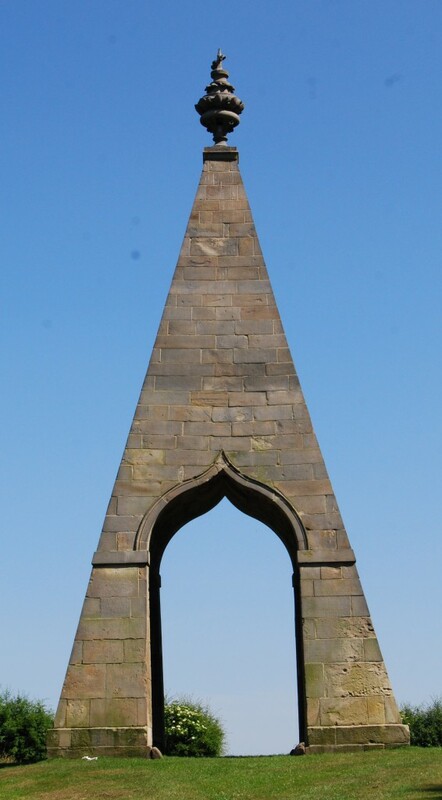 The most enigmatic of the Wentworth Monuments is the Needle’s Eye. 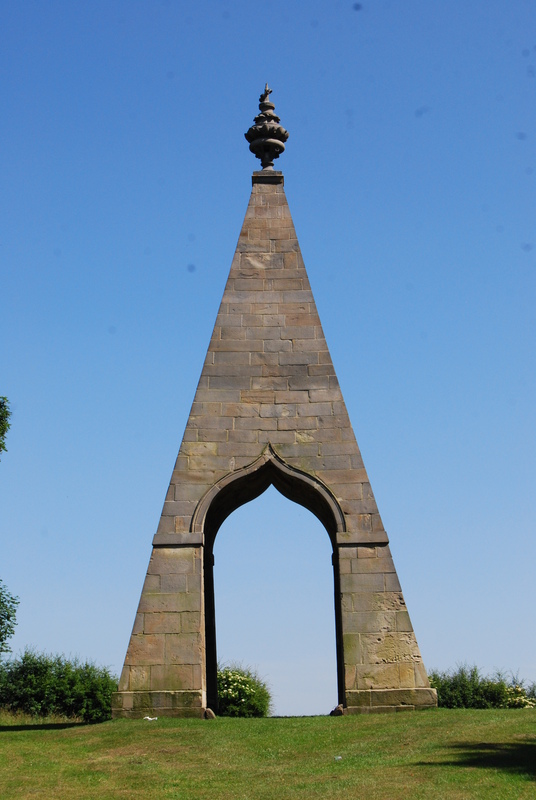 It is simply 45ft-high ashlar pyramid penetrated by an ogee arch sitting at the topmost point of a ride that runs in a direct line from the home-park gate to the distant Lion Gate at Rainborough, which was described on a 1778 map as “the coach road from Wentworth House to Pontefract”. It’s a distinctive eye-catcher with no discernible purpose. The story universally but vaguely told is that it enabled the second Marquis to win a wager that he could drive a horse and carriage through the eye of a needle, contradicting Matthew 19:23-26 (and also Mark 10:24-25 and Luke 18:24-25). The date of the wager, 1780, would associate the design with John Carr, who also designed Keppel’s Column (1773-80) and the Rockingham Mausoleum (1784-1788), but it appears on a bird’s-eye view dated 1728, and there is evidence of an “obelisk” on the site as early as 1722-3. The nearest approach to firm corroboration of this likeable story is an account of the 7th Earl Fitzwilliam driving a gun carriage through the Eye at the time of the Great War. If he did so he was probably also good at reverse parking. This entry was posted in Country Houses, Country Houses of South Yorkshire on January 25, 2014 by Mike Higginbottom. Hoober Stand is an intriguing building, whichever way you look at it. It’s triangular in plan, pyramidal in profile, with a cupola at the top which always looks off-centre, though in fact it isn’t. It ostensibly celebrates the victory of King George II at the Battle of Culloden in 1745, while also marking the elevation of the Thomas Watson-Wentworth, 1st Earl of Malton, to the superior title of 1st Marquis of Rockingham. Like the later Rockingham Mausoleum, it is maintained the Fitzwilliam Wentworth Amenity Trust and opened to the public on Sunday afternoons in the summer: http://www.wentworthvillage.net/monuments/hoober-stand. 98 feet high, it has 150 steps to the platform. The view is spectacular. This entry was posted in Country Houses, Country Houses of South Yorkshire, Life-enhancing experiences on January 25, 2014 by Mike Higginbottom. Charles, 2nd Marquis of Rockingham, who built Keppel’s Column, died unexpectedly in 1782, a few months after he became prime minister for the second time. His nephew and heir, the 4th Earl Fitzwilliam, erected a great monument to him within sight of the front door of the mansion. Designed, like Keppel’s Column and much else on the estate, by John Carr of York, the Rockingham Mausoleum isn’t actually a mausoleum. Rockingham is buried in York Minster, so this memorial to the prime minister is in fact a cenotaph. The three-stage structure contains a fine statue of the Marquis in his Garter robes by Joseph Nollekens, surrounded by niches containing busts of his political allies – Edmund Burke, Lord John Cavendish, Charles James Fox, Admiral Keppel, John Lee, Frederick Montagu, the 3rd Duke of Portland and Sir George Saville. After years encased in steel to protect it from post-war mining, the Rockingham Mausoleum is now maintained the Fitzwilliam Wentworth Amenity Trust and opened to the public on Sunday afternoons in the summer: http://www.wentworthvillage.net/monuments/the-mausoleum. 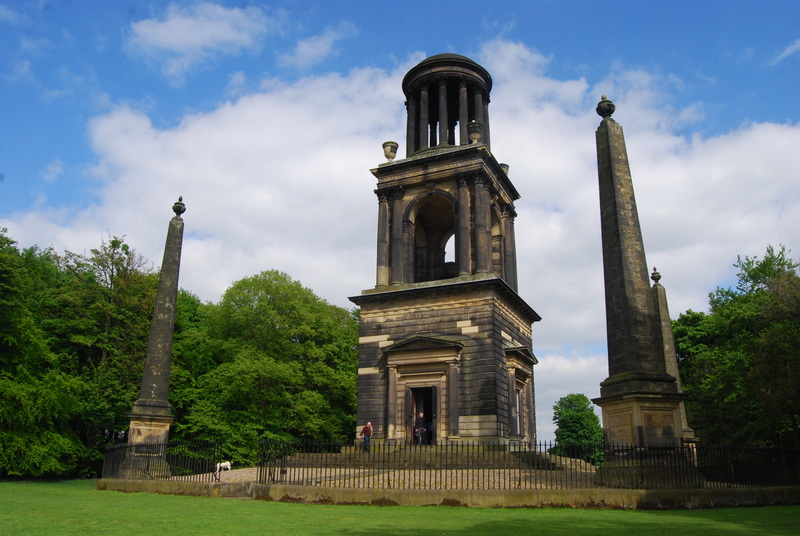 The landscapes around the two great Strafford mansions of Wentworth Woodhouse and Wentworth Castle are dotted with towers, columns, obelisks and other structures, making statements about status and politics. 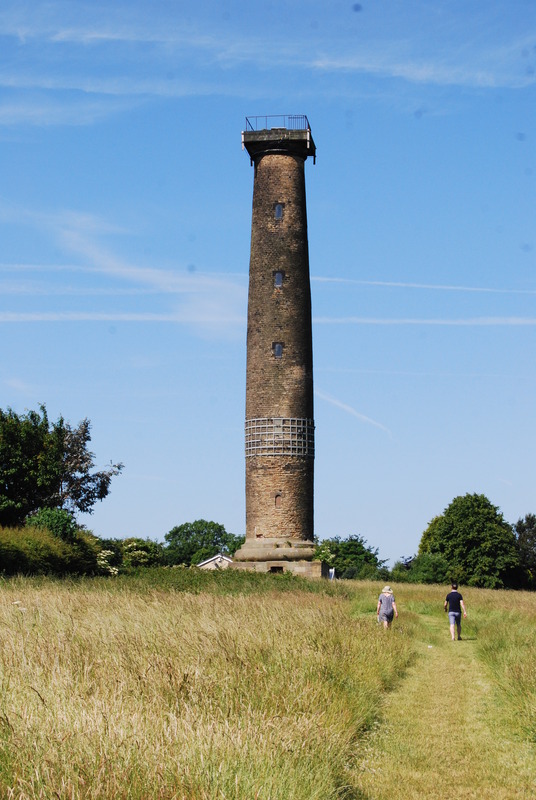 When I take people to explore the Wentworth Woodhouse estate I like to begin at Keppel’s Column, the column on the horizon marking the southern boundary of the estate. From there you can see the mansion and all the most significant monuments dotted around the miles of parkland. It was erected by Charles, 2nd Marquis of Rockingham to celebrate the acquittal of his friend, Admiral Viscount Keppel, who had been court-martialled for losing a naval engagement against the French. Rockingham was at the time leader of the opposition between his two terms as prime minister, and made a point of celebrating Keppel’s political victory over the Tory court party of George III. The column is not as the architect John Carr would have wished. It was intended to be a 150ft rostral column (with ships’ prows projecting) surmounted by a 30ft-high statue of the admiral. During construction the height was reduced to 115ft, which made the proportions unsatisfactory: the entasis – the bulge which is necessary to make any classical column appear straight-sided – changes uncomfortably part way up. There is a spiral staircase to the platform at the top of the Column, at present unsafe and inaccessible. 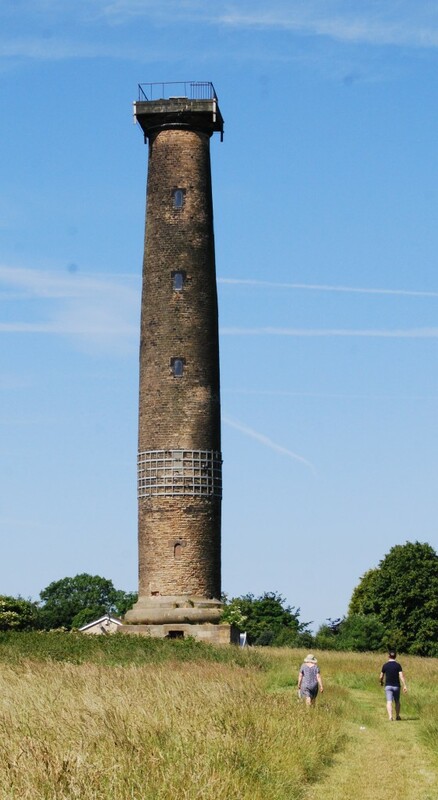 Keppel’s Column is now maintained by Rotherham Borough Council. There are recent photographs of the view from the top – taken from a cherry-picker when the structure was last inspected. None of these seem to have found their way on to the web, but Kenny Fox has a fine aerial view: http://www.holisticfraternity.co.uk/Keppels.html. Visiting Cannon Hall, at Cawthorne near Barnsley, is a game of two halves. The extensive park, which includes a farm and a garden centre, is a magnet for visitors. The house, which was the seat of the Spencer-Stanhope family until 1951, opened as Barnsley’s municipal museum six years later. Barnsley Borough Council acquired a completely empty house: the contents have been collected since 1957 and so the visitor sees an elegant eighteenth-century house, substantially as it was designed by John Carr of York, with a late-Victorian ballroom wing added, and elegant eighteenth-century furniture that doesn’t necessarily belong. That needn’t detract from the enjoyment of the place. It’s not a house-that-time-forgot, like nearby Brodsworth Hall, nor is it a fully displayed glass-case museum like the Doncaster museum at Cusworth Hall. The best way to enjoy the country-house aspects of this particular country house is to join a guided tour, when curatorial staff can explain and explore the furniture and bring to life the lifestyle of the family of Walter Stanhope (1750-1821), who commissioned Carr, the plasterer James Henderson of York, and “the most eminent Cabinet Makers” whose original items have long since been scattered. The other historical interest of Cannon Hall lies in the family associations with the Pre-Raphaelite Brotherhood. The younger son of Walter Spencer-Stanhope’s heir John Spencer-Stanhope (1787-1873) was the artist John Roddam Spencer-Stanhope (1829-1908). A dreamy video of his work can be seen at http://www.youtube.com/watch?v=lQYZq3DCB2g&list=PLvIwNyf0RZgMPgydtjejzTLjQxZ62W3He&index=10. Two of Roddam’s nieces were Gertrude Spencer-Stanhope (1857-1944) and Evelyn de Morgan (1855-1919). Three of Gertrude’s bronze sculptures belong to the Cannon Hall collection. Many of Evelyn’s paintings belong to the De Morgan Foundation, a collection gathered by Evelyn’s sister Wilhelmina, the formidable Mrs A M W Stirling (1865-1965). 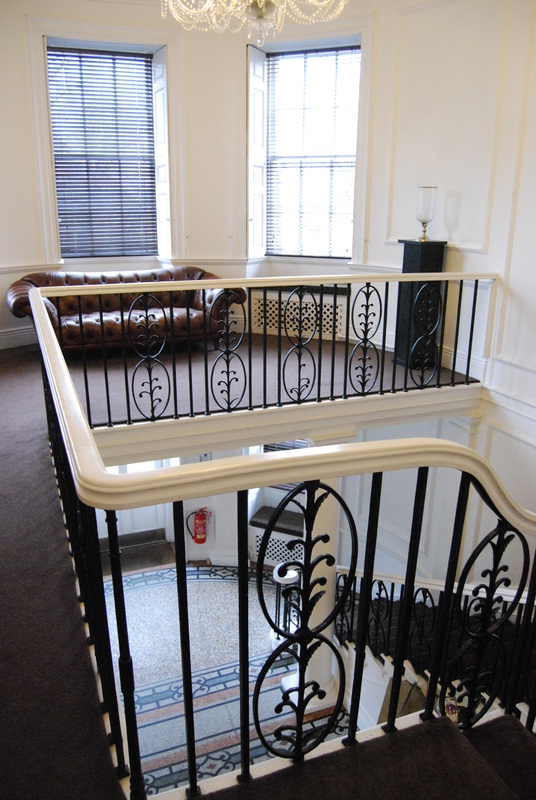 The De Morgan Centre is housed adjacent to Wandsworth Museum: http://www.demorgan.org.uk. This entry was posted in Country Houses, Country Houses of South Yorkshire on January 24, 2014 by Mike Higginbottom. I wrote about the rivalry between the descendants of the 2nd Earl of Strafford that littered eighteenth-century South Yorkshire with mansions, temples, obelisks and columns in an article about Wentworth Castle. The race to amass the most and best titles and houses was ultimately won by Thomas Watson-Wentworth (1693-1750) who became Baron Malton (1726), 1st Earl of Malton (1734) and then 1st Marquis of Rockingham (1746), and built not one but two magnificent houses, consecutively, back-to-back. He began what is now the west wing of Wentworth Woodhouse, a fine but not entirely symmetrical baroque house in brick, in 1726. A plan dated 1725 proves that an east wing was always intended, but Flitcroft’s beautifully proportioned design was a gigantic version of the long-gone Wanstead House in Essex, stretched to 606 feet. 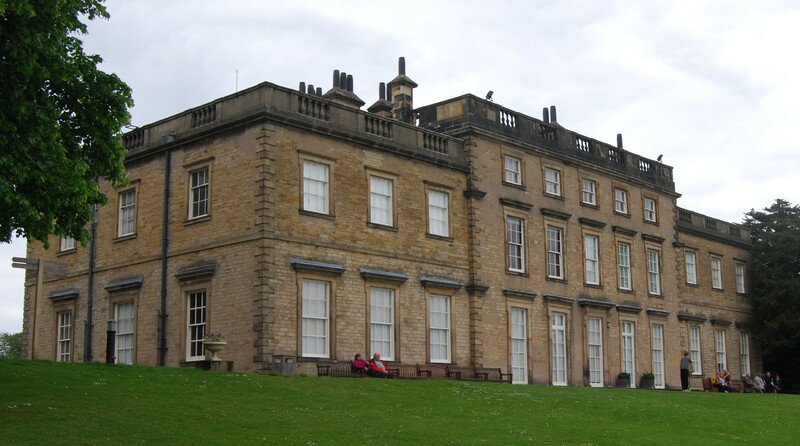 By this means Wentworth Woodhouse became the largest and grandest semi-detached house in Britain. After the Second World War this vast place became impossible to maintain, especially when the Minister of Power, Emmanuel Shimwell, insisted on bringing opencast coal mining to within sixteen feet of the west wing. The 8th Earl Fitzwilliam’s aunt, the Labour councillor Lady Mabel Smith, arranged for the East Wing to be leased to West Riding County Council as a teacher-training college. After the death of the tenth and last Earl in 1979 and the closure of the college some years later the two houses were reunited and now belong to Mr Clifford Newbold who is gradually restoring the buildings and grounds. At last it’s possible to visit Wentworth Woodhouse, and to marvel at the way it’s being brought back from the brink. And wherever you step from the East Wing to the West Wing and back again, there are always a couple of steps, because the two parts of the house are on different levels. This entry was posted in Country Houses, Country Houses of South Yorkshire on January 23, 2014 by Mike Higginbottom. There’s a setting for a novel around Aston Hall, in the south-east corner of South Yorkshire – a sort of Alan Hollinghurst meets Jane Austen, with more than a dash of Anthony Trollope. The key character, probably the narrator like Mr Lockwood in Wuthering Heights, is the poet Rev William Mason (1724–1797), the Rector of Aston, whose Musaeus (1747), a monody on the death of Alexander Pope, and his historical tragedies Elfrida (1752) and Caractacus (1759) have hardly stood the test of time. He’s better known as the editor of the poems of his friend Thomas Gray, whose ‘Elegy written in a country churchyard’ is one of the best-loved eighteenth-century poems in English. Mason and Gray shared friendship with Horace Walpole, whose catty observations are so vivid you can almost hear his voice. Walpole’s residence, Strawberry Hill was a gathering ground for some of the brightest and most sophisticated wits of the day. Mason’s rectory was similarly a centre for creativity, conversation and cyncism. He was rector of Aston from 1754 to 1797, and though he didn’t live there continually, he must have watched from the rectory the rebuilding of Aston Hall on the opposite side of the church after a fire in the 1760s. The owner, the fourth Earl of Holderness, had it rebuilt in the Palladian style by the ubiquitous, versatile and highly respected architect John Carr of York. Once it was finished in 1772, Lord Holderness declined to move in: Walpole declared this was “because it is too near the ducal seat at Kiveton”; in other words, the earl didn’t want to be overshadowed by the Duke of Leeds at Kiveton Park. After all, Robert Darcy, 4th Earl had been ambassador to Venice and The Hague, Secretary of State (then one of the great offices of state) and later became tutor to two of George III’s sons, in which capacity Walpole described him as “a solemn phantom”. Lord Holderness let the house to Harry Verelst (1734-1785), whom Walpole described as “the Nabob” – the term for an opportunist who had made money in India. He was Governor of Bengal from 1767 to 1769. Verelst purchased Aston Hall in 1774-5 and employed the local architect John Platt to install a finer staircase and the west wing. His descendants lived there until 1928. Mason was distantly related to both Lord Holderness and Harry Verelst. One may imagine the twitching of curtains at the rectory, and the comments of Rev Mason and his wife about the nabob’s taste. Sitting in the bar and lounge of the Aston Hall Hotel [http://www.tomahawkhotels.co.uk/home.aspx?h=1], it’s possible to see Lord Holderness’ viewpoint. Even though Carr’s rooms have been much carved about by institutional use it’s clear that they would hardly have been grand enough for an earl to entertain. It’s more than comfortable for modern visitors, set in a quiet village literally within two minutes of Junction 31 of the M1. It’s an interesting alternative to a comfort stop at Woodhall Services. This entry was posted in Country Houses, Country Houses of South Yorkshire on January 2, 2014 by Mike Higginbottom. Mrs Pearse, the last private owner of Cusworth Hall, didn’t make her land agent’s life at all easy. After selling the contents of the house in 1952 to help pay her late brother’s death duties, she insisted that the sale of the Hall must not interfere with the use of the Chapel which, as Mother Mary Francis of the Order of St Hubert, she opened for worship in 1953. She belonged to the Liberal Catholic Church (not to be confused with the Liberal Catholic Church International, the Liberal Catholic Church Grail Community, the Liberal Catholic Church Theosophia Synod, the Liberal Catholic Apostolic Church or the Reformed Liberal Catholic Church [http://en.wikipedia.org/wiki/Liberal_Catholic_Church]). At one point there was a practical threat that Cusworth Hall would be purchased, compulsorily or otherwise, for use as a female Borstal. Two separate occupiers moved in without legal contracts, and were removed with difficulty. Doncaster Corporation considered turning the place into a zoo. Eventually Doncaster Rural District Council – at the time the most prosperous rural-district authority in the country because of the wealth of coal-mining in its area – purchased it for £7,500 in 1961, first proposing to convert the Hall into a hospital. 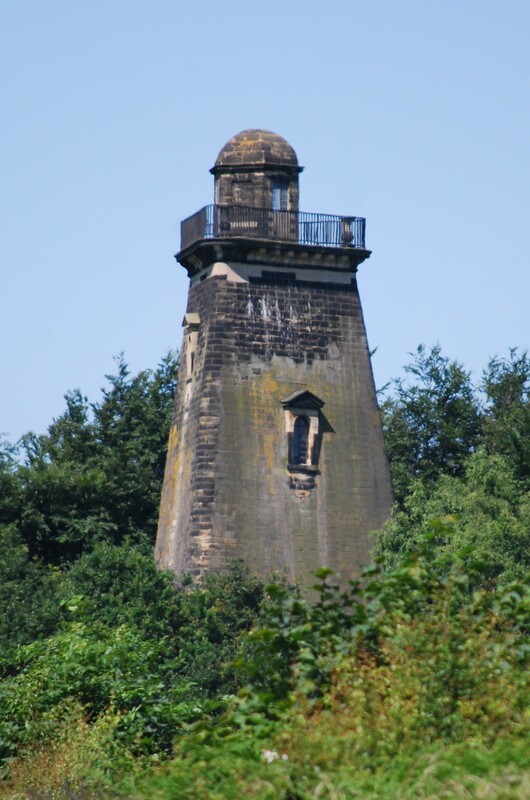 In 1967 it opened to the public as an industrial museum and after transfer to the newly-formed Doncaster Metropolitan Borough Council in 1974 it became the Museum of South Yorkshire Life. As such it presented a rich clutter of displays about every conceivable aspect of local life and culture – far more than could comfortably fit into the elegant ground-floor rooms and the bedrooms above. 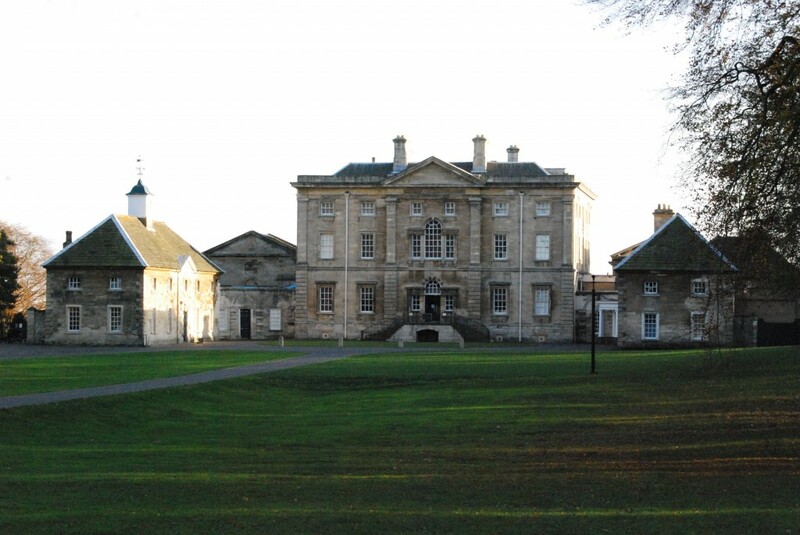 In 2004-7, the council emptied the building and invested £7½ million in a superb restoration of the house and park. And then they put all the stuff back inside. The result is that the Georgian rooms, with the exception of James Paine’s superb chapel, are dominated by beautifully designed modern display cases which would fit well into a disused textile mill, a warehouse or a spacious church. At Cusworth, you can’t see the room, and for that matter you can’t see the display case, though you can see the contents quite well. It matters not, because the thorough restoration will last longer than any museum-display fashion. Doncaster’s proud history needs much more space to celebrate the market-town, the agriculture and the mining industry, as well as the Great North Road, the Great Northern Railway and the racecourse, home of the St Leger. The Borough of Wakefield has found means to move its art gallery out of a cramped Georgian terrace into Hepworth Wakefield [http://www.hepworthwakefield.org], a superlative new building by David Chipperfield. Doncaster’s history deserves no less. 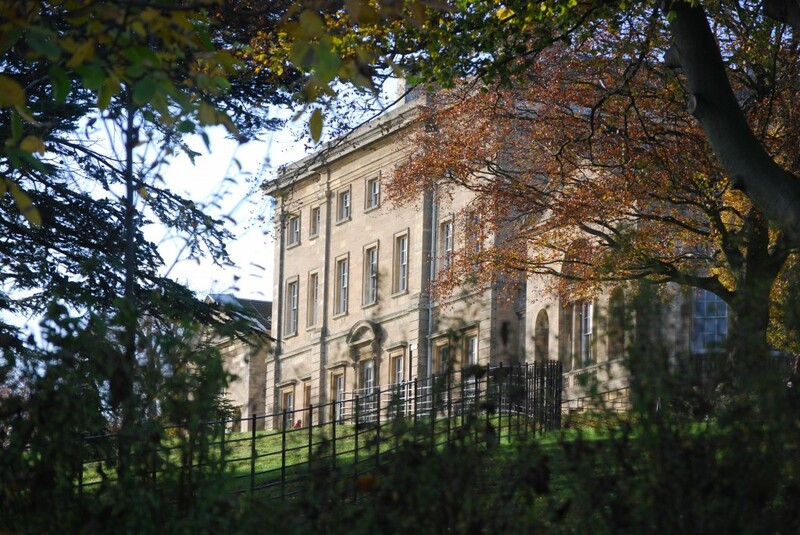 And Cusworth Hall would make a fine art gallery, like Tabley House in Cheshire [http://www.tableyhouse.co.uk] or a beautiful hotel-restaurant, like Colwick Hall in Nottingham [http://www.colwickhallhotel.com]. Cusworth Hall, on the outskirts of Doncaster, is one of those country houses where the life-stories of the owners rival in interest the magnificent architecture. Ownership passed directly from the original builder of the present house, William Wrightson (1676-1760) for over two hundred years. When William Henry Battie-Wrightson died suddenly in 1903 his widow, Lady Isabella, took on the responsibility of running the estates in Yorkshire, Durham and Northumberland and residences in London and St Leonard’s-on-Sea while bringing up her son and daughter, then aged fifteen and thirteen respectively. She was a formidable character, eldest daughter of the third Marquis of Exeter of Burghley House near Stamford. She fought off a rival claim to the estates from her brother-in-law, and improved the house by building the dining-room north of Paine’s chapel-wing and installing hot-water central heating and electric lighting. She regularly gave fancy-dress parties for the estate workers, and mounted a magnificent celebration when her son came of age in 1909. Her son, Robert Cecil Battie-Wrightson (1888-1952), must have been a disappointment. In 1914 he married a widow, Mrs Louie Evelyn Lupton, daughter of the landlord of the Elephant Hotel in Doncaster. After serving throughout the First World War he settled down to a life of ease, preferring the company of public-houses and maintaining cordial relationships with his own staff. When his marriage with Louie Evelyn broke down they separated but did not divorce: he had formed a relationship with Mrs Christabel Florence Bentley, whose divorced husband also ran a pub in Doncaster. He did not mix with other local gentry families. When he died of a stroke in 1952 the estate passed by entail to his sister Barbara, though he left his personal estate, valued at £64,000, to Mrs Bentley. Barbara Battie-Wrightson (1890-1989) was perhaps even more independent-minded than her brother. She had considerable musical talent, played violin and cello, and appeared on the music-hall stage without her mother’s knowledge in a song-and-dance routine as Hazel Barnard. She held socialist opinions and trained as a nurse, working with poor and homeless people in London. She changed her forenames to Maureen Leslie. Her Cecil relatives effectively disowned her and her mother’s will threatened to cut off her income if – as seemed likely – she became a Roman Catholic. Her first marriage, in 1917, to Major Oswald Maslen Parker was not a success, but only ended with his death. Her second, to a dentist, Dr Walter Leslie Pearse, gave her much greater happiness, though her husband and her brother famously failed to get on. Death duties of £280,000 on Robert Cecil Battie-Wrightson’s estate forced the sale of almost the entire contents in 1952. Among the items dispersed were numerous pieces of Chippendale furniture, a gold presentation cup won at York races in 1725 and the Titian ‘Holy Family with Elizabeth and St John’, which fetched 130 guineas. The total proceeds of the nine-day sale were £36,000. The Hall itself was eventually sold to Doncaster Rural District Council for £7,500. Mrs Pearse never occupied the house.